Antonette Todd (center) with co-advisers Nicole Donofrio of UD and Venu Kalavacharla of Delaware State University. 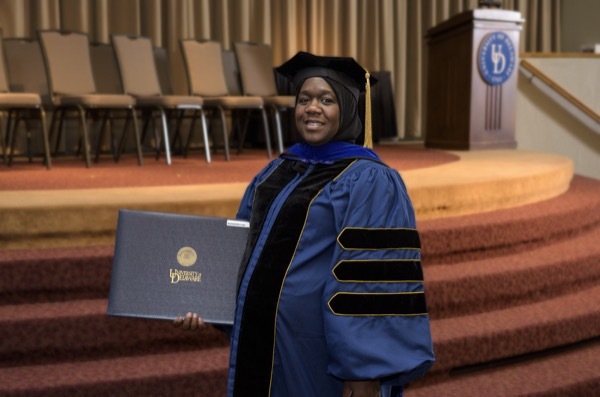 Antonette Todd at UD's doctoral hooding ceremony in December. 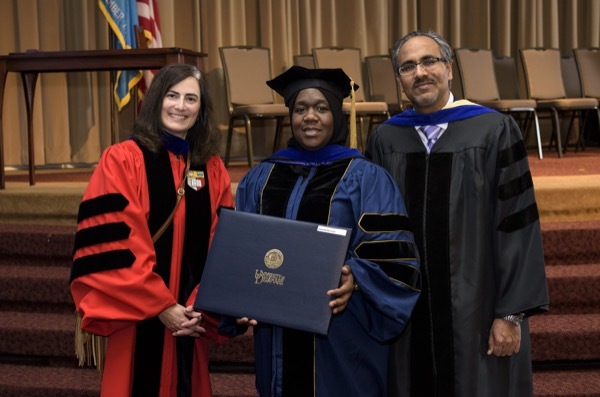 11:30 a.m., Feb. 9, 2016--After the University of Delaware’s doctoral hooding ceremony on Dec. 18, Antonette Todd spoke with her two advisers, Nicole Donofrio and Venu (Kal) Kalavacharla, which is not unusual after receiving such a prestigious honor. What was unique about the situation, however, is that the professors came from two different universities, UD and Delaware State University. Todd had previously completed her master’s degree at Delaware State with Kalavacharla – director of the Center for Integrated Biological and Environmental Research (CIBER) and professor of molecular genetics and epigenomics at Delaware State who holds an adjunct appointment in UD’s Department of Plant and Soil Sciences in the College of Agriculture and Natural Resources (CANR) – and went on to work as a research technician in his laboratory. Knowing that Todd wanted to go on to get a doctorate, but also aware that no such program existed in plant science at Delaware State, Kalavacharla reached out to Donofrio, associate professor of plant and soil sciences at UD, to see if she would be able to assist. Donofrio and Kalavacharla had worked together on a United States Department of Agriculture (USDA) grant and when they needed someone to continue working on the project, Kalavacharla suggested Todd. Todd’s doctoral research interest was in plant pathology, specifically studying the interaction between the common bean and fungal rust, carrying over the work she did for her master’s degree but looking at it from a different angle. “The ultimate goal is to find a resistance gene in the common bean,” said Todd. Rust fungus is a major problem worldwide and while there is some genetic resistance, the pathogen eventually finds a way to overcome the resistance, leaving the researchers back at square one. The fungus is also difficult to work with as it can only be cultured on actual plants and not on petri dishes. Todd’s project had to do with trying to figure out the underlying basis of cryptic resistance regions of the bean genome, working with plants that Kalavacharla had found during his doctoral research to understand what genes play a role and the location of important genes involved in the rust resistance response of the common bean. Along with Kalavacharla and Donofrio, she was guided by UD committee members Randy Wisser, associate professor of plant genetics; Tom Evans, professor of plant and soil sciences; and Adam Marsh, associate professor in the College of Earth, Ocean, and Environment (CEOE), who provided support and valuable mentoring along the way. Todd used next generation sequencing and bioinformatics to try and determine what those genes were and got pretty close, narrowing it down to one well-defined region with a number of genes that look promising. Her work will allow a future student to come in and do their research around figuring out and identifying the magic gene. “She was successful in pinpointing the region of one of those genes to a base region in the bean genome by a combination of genetics, molecular biology, genomics, and bioinformatics,” said Kalavacharla. Todd not only worked at pursuing her doctorate, she also retained her job as a technician in Kalavacharla’s lab and had three children at home to care for, one born during her pursuit of her doctorate, and with a fourth due shortly after completion of her degree work. “The great thing about the fact that Antonette had a successful Ph.D. experience is that we’ve demonstrated that you can do this even if you have a growing family or a young family – you can maintain your employment status and still get a Ph.D. You just have to be really determined about it and dig your heels in, and that’s exactly what she did,” said Donofrio. “I think I’m the first, at least from the College of Agriculture and Related Sciences at DSU – I’m not sure if they’ve done it at any of the other colleges from Delaware State but definitely from this college it was the first collaboration between DSU and UD for a Ph.D.,” said Todd. Donofrio said she is hopeful that UD and Delaware State can have more such collaborations in the future and that it shows that individuals who really want to get their doctorate but still want to keep their jobs can do both. “We demonstrated that people, if they’re determined about it and if they really want it, we can pave a way for them to keep their employment and get a Ph.D. That Kal and I were able to successfully co-advise her to completion was a good thing,” said Donofrio. Todd said that for anyone out there looking to get their Ph.D., the biggest piece of advice is to have patience. “Have patience with yourself and have perseverance. Keep your eye on the goal, that’s the biggest thing,” said Todd.